This is a factory refurbished belt sander, which is fully certified and tested. It also comes with a one year warranty, backing up the quality of the refurbishment. The ZRBE319 features tool-less tracking adjustment for ease of use, and is light and easy to use. The ZRBE319 is a good beginners' tool, ideal for the light carpentry requirements of the average householder. While the ZRBE319 lacks the power to handle hardwoods, it performs well on a variety of softwoods, and is excellent for smaller projects. For the hobbyist, or someone who simply wants to have tools available if they need them, this is a suitable and affordable piece of equipment. The Ryobi ZRBE319 has been refurbished to a high standard, and is designed with the novice user in mind. It is simple and easy to use, and performs well on small, light carpentry projects. 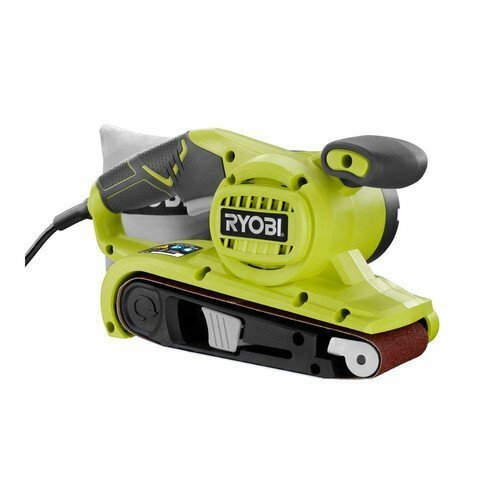 Although it is a refurbished, rather than brand new, unit, the Ryobi ZRBE319 does come with a 12mth warranty, and works out about the same as hiring a sander for the day. For people simply looking to have a good, basic sander available for home repair or small DIY projects, the ZRBE319 represents quality and value for money. For a professional, or someone doing a lot of woodworking, it would be advisable to invest in a more expensive, and ideally brand new, model.